Nissan has launched a series of new ads, showcasing the 2017 Nissan Maxima Midnight Edition and the 2017 Nissan Rogue Sport, as well as some of their exterior accessories that can set you, as a driver, apart from the crowd. 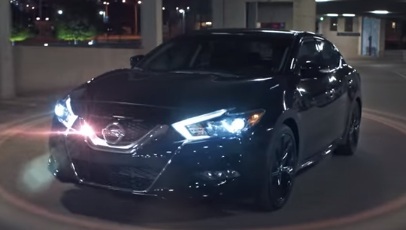 One of the spots, titled “Curb Appeal” and aiming to highlight that you don’t need permission to take on the world with the 2017 Nissan Maxima Midnight Edition, features a young man walking through a parking lot late at night and getting in a Nissan Maxima Midnight Edition. “Ready to take on the world? You’re not waiting on a stylish limited edition specially appointed invitation, are you?” – asks a female voiceover, who receives a “No” in response from the man. “I didn’t think so.” – answers the voiceover, urging viewers to “take on today”. The brand describes the Maxima SR Midnight Edition as “raw, refined and built to turn heads” thanks to its design and features, including Charcoal Premium Ascot Leather-appointed seats with Alcantara inserts, four available exterior colors, and finished with 19″ gloss black aluminum-alloy wheels, black sport spoiler and black rear diffuser.